Protesters say they were beaten and suffered emotional stress. Occupy Cal protesters who filed a federal lawsuit last November against UC Berkeley amended that suit to demand $15 million following a protest last year. 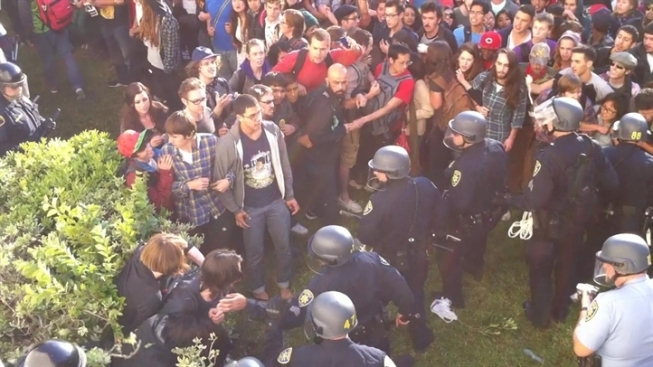 On Nov. 9, 2011, police officers got into a confrontation with Occupy Cal protesters following the removal of occupy tents. Wednesday protesters announced that they would amend their lawsuit to demand $7.5 million in compensatory damages for physical and emotional harm and denial of Constitutional rights, and $7.5 million in punitive damages. The amended suit will also demand the school redress the protesters for "false arrests and UCB’s political witch hunt" against them. "We want this to set the precedent for every university administration, that they will not attack our right to protest for public education. Through the course of this lawsuit, we will use every means at our disposal, including legal and direct action, to expose UC-Berkeley’s policy of political suppression and win justice," said Yvette Felarca, a lead plaintiff and a BAMN national organizer. In March the school ordered Felarca and four others to stay at least 100 yards away from all UC property. Those charges were later dropped.